1. To prepare the ribs, place 1 litre cold water in a pan and warm over a medium heat. Add the salt and stir until dissolved. Remove from the heat and allow to cool by placing the pan in a bowl full of iced water. 2. Warm the whiskey in a small pan over a medium heat. When it comes to a boil, carefully ignite it with a match. When the flames disappear, simmer until reduced slightly. Allow to cool completely, then add it to the salt brine. 3. Pour the cool brine in a large airtight container, add the short ribs and seal with the lid. Put in the fridge for 12 hours. Remove the ribs from the brine and place into a bowl of cold, fresh water. Allow to soak for 3 hours, changing the water every 30 minutes. 4. Place the ribs into a large pan. Add the stock and enough cold water to cover the meat. Warm over a medium heat. Bring to the boil, then reduce the heat and simmer gently for 3 hours, or until the meat is tender. Turn off the heat and leave the meat to cool in the stock. When cool, remove the meat from the stock and set aside. 5. Return the pan of stock to a high heat and bring to the boil until reduced by two-thirds, skimming the surface to remove any foam throughout. Remove from the heat and set aside. Reserve 600g of stock for the barbecue sauce. 6. Next prepare the barbecue sauce. Place the oil in a saucepan over a medium heat. Add the garlic and shallots and sweat for 2-3 minutes until soft. Add the dry spices and continue to cook for 2 minutes, stirring throughout. Mix in the tomato passata, vinegar, sugar, Worcestershire sauce, golden syrup, salt and pepper. Reduce the heat to low and cook for 20 minutes, then stir in the reduced stock. 7. Preheat the barbecue. When hot, add the ribs and cook, turning often and basting with the barbecue sauce, for 3-5 minutes, until browned. 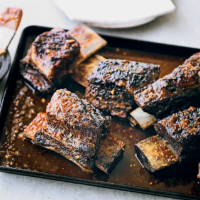 Move the ribs to the coolest part of the barbecue and cook for a further 30 minutes, turning often and basting with the sauce throughout, until glazed and piping hot. Warm any remaining barbecue sauce and serve with the ribs.